Decades of a school system ethnolinguistically segregated along Mother Tongue Instruction (MTI), compounded by a 30-year-long ethnic conflict, has had significant consequences for ethnic relations among the diverse population of Sri Lanka. The recently introduced Bilingual Education (BE)—English and Sinhala/Tamil—has enabled some core subjects to be taught using English Medium Instruction (EMI), bringing together students of different ethnicities in multiethnic, bi-media schools. This has created a new social space and, thereby, new possibilities for changing social relations. In this chapter, we explore BE students’ ethnic identity orientations through analysis of their expressed feelings and perceptions towards ethnically diverse ‘others’, before and after joining multiethnic BE classrooms. Using the Bourdieusian conceptual triad of habitus, capital and field, we present analysis of data collected in two, multiethnic schools in Sri Lanka. 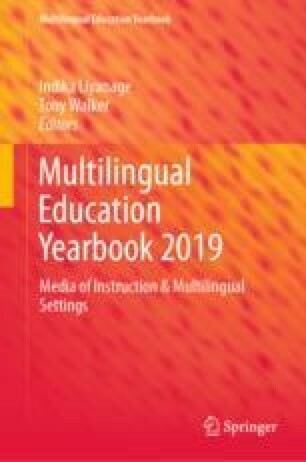 The findings show that during early socialization in ethnically-exclusive institutions, such as family and monoethnic classrooms, students acquire insular, ethnocentric dispositions that undergo reorientation towards more supraethnic, inclusive dispositions when students get to know each other and study together in multiethnic BE classes. Learning through English as a common language, and cross-linguistic flexibility, made possible a growing positive inclination towards people of different ethnolinguistic backgrounds, and recognition, respect, and increased acceptance of diversity and heterogeneity. The findings are highly relevant to post-conflict, ethnolinguistically heterogeneous societies, especially in terms of how language in education could be utilized in promoting interethnic relations and thereby national solidarity. Census and Statistics Department. (2012). Census of population and housing [Data file]. Retrieved from http://www.statistics.gov.lk/PopHouSat/CPH2011/Pages/Activities/Reports/FinalReport/FinalReportE.pdf. Ministry of Education. (2016a). School census preliminary reports 2016. Retrieved from http://www.moe.gov.lk/english/ on October 20, 2017. Nadesan, S. (1957). Regional autonomy in a multi-national state 1957. Ceylon Sunday Observer July 1957. Retrieved from http://sangam.org/regional-autonomy-multi-national-state/ on August 15, 2018. Parliament Secretariat of Sri Lanka. (2015). The constitution of Sri Lanka (Revised Edition 2015). Retrieved from www.parliament.lk/files/pdf/constitution.pdf. Saunders, B. (2007). (Post) colonial language: English, Sinhala, and Tamil in Sri Lanka. Retrieved from http://homes.chass.utoronto.ca/~cpercy/courses/eng6365-saunders.htm. Spolsky, B. (2011). Does the United States need a language policy? Retrieved from http://www.cal.org/resource-center/briefs-digests/digests/%28offset%29/15.